In the hustle and bustle of every day life, it is nice to know, Quaker® Cereals, a staple in our pantry, can be easily incorporated into delicious and satisfying meals and snacks. One dish my family loves, is this easy to make, sweet and spicy Streusel Topped Sweet Potato and Carrot Casserole. If you love Chicken and Dumplings, you will love Chicken Dumpling Casserole! I have certainly made my share of Chicken and Dumplings (check below for links) and love this easy casserole for a fast and fabulous meal made with Homemade Biscuit Mix and a Homemade Cream of Soup Base. Oh...My! This Hash Brown and Sweet Pepper Kugel turned out so light yet full of flavor! We all loved it and a couple of us ate this, skipping the meat, with green beans to complete our meal. It is so easy to make, I do not know why I have never made this before! It is a keeper and will definitely be added to our menu. Friday night is pizza night at our house. Usually. Since my youngest son has been sick, I didn’t feel like making homemade pizzas but wanted to make something similar. 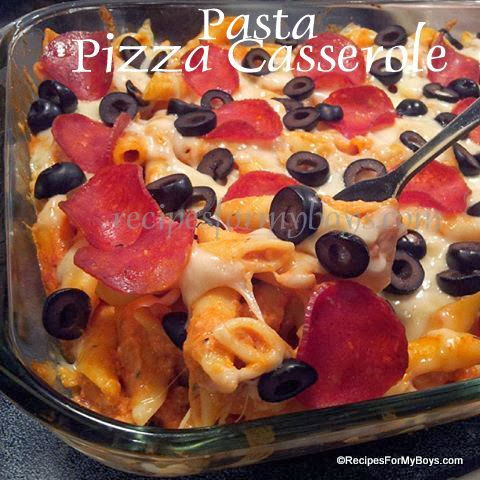 This Pasta Pizza Casserole turned out to be perfect. Cheesy and saucy (if you add more, I didn’t) with your favorite pizza toppings. Cooked in a casserole while you tend to more pressing things..like nebulizers and meds and making certain others are not neglected. Tater tot casserole has been around for a long time, hasn't it? It is in old cookbooks, magazines revamp it once in awhile and I even remember seeing it on the show with all the children that start with a J. I have to say, I admire Michelle. There is absolutely no way I could have 19 children and keep my wits about me. Cooking,, cleaning, homeschooling, church and who know what else she does. Nope. There is No. Way. Any who, back to the tater tot casserole. It's National Hot Dog Day and we are celebrating by eating Chili Cheese Dog Casserole. Don't ya just love it?! This casserole reminds me of Mama. She would make this after coming home late from work. Something easy to throw together while she helped with homework and listened intently about my day. I didn't like it then, but I love it, and the warm memories it brings. This is so good! It’s like eating Doritos and a delicious, hearty dip for supper! Enjoy! I have seen casseroles made with Jiffy Mix for some time now. Heck, forever! I finally made one with the popular mix and Oh, My, Goodness! I love it. Hubby loves it! They (don’t like broccoli) My oldest son loves it! Easy to make with whatever you have on hand. Mix and bake, yep, I love that, too! This is an easy and economical side or main dish (double recipe.) Add your favorite herbs, meats and cheeses or leave it plain. Any way you make it is going to be a hit! My oldest has been wanting me to make a pot pie lately. Of course, I had to oblige. This was so easy to make .... I don't know why I haven't done so before. Use any leftover meat and vegetable combinations to make this comfort food. Enjoy! You don’t have to buy those cans of "cream of" based soups again. Use this as a start for everything from soups to casseroles. Add your own meat, vegetables, herbs and seasonings to this base to make your best recipes homemade!